Have you ever played scrabble? It's not one of my favorite games but it does help keep my brain working. If you've played the game you know it can take a while to play. Mickey introduced me to a version of the game we can play when we have a free minute sometime in the day. 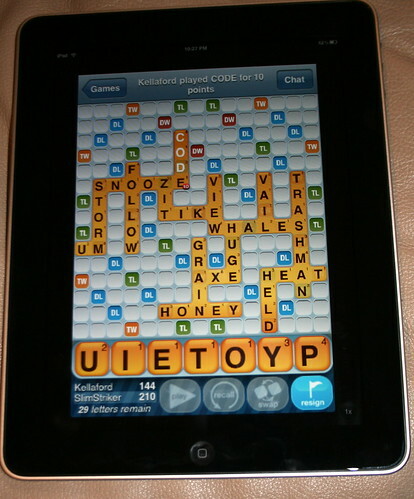 He and I can play each other, him on his iPhone and me on the iPad, using the iPhone app for Scrabble. We're on our third game, me winning the first and him winning the second. He's also playing games with four other people! Talk about multi-tasking.